Sears is laying off Kmart workers in an apparent move to cut costs as the company struggles to stay afloat. The layoffs, executed last week, targeted full-time workers, including assistant managers and department heads — or "leads" as Kmart calls them — across the country. Full-time workers are salaried with benefits, which makes them more expensive to employ than part-time workers. Sears, which owns Kmart, confirmed the layoffs to Business Insider. "Eliminating positions is never an easy decision to make, and we don't take it lightly as we recognize the valuable contributions affected associates make to the company," Sears spokesman Howard Riefs said. "We are hopeful that associates affected by reduced staffing requirements apply for open positions at other Sears and Kmart locations." The apparel retailer has had a difficult few years. J. Crew announced in November that sales at stores open at least a year dropped 8%, following a decrease of 11% in the same period last year. Now, the company is attempting to change things up. In November, the retailer axed its popular bridal line. A month earlier, J. Crew launched an athleisure line with New Balance — a collection that Business Insider felt failed to live up to competitors' standards. Sears' sales continued to plunge in 2016. In the most recent quarter, revenue fell 13% to $5 billion, with losses widening to $748 million from $454 million in the third quarter last year. 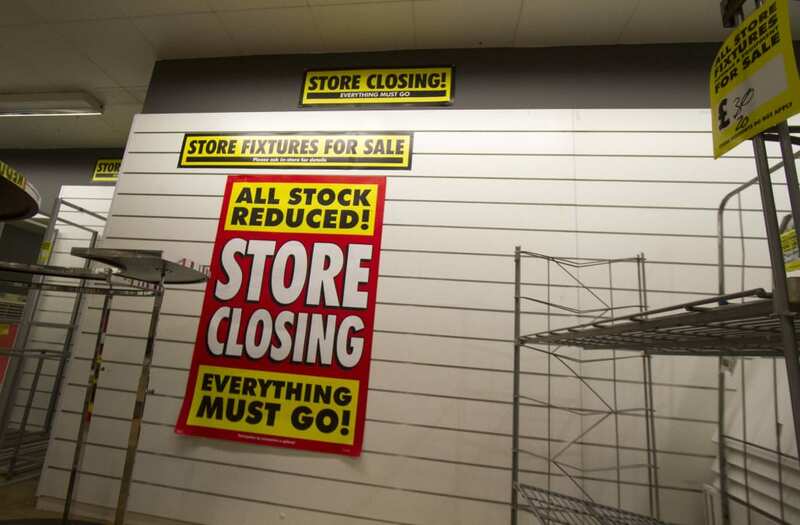 The retailer is closing hundreds of stores, with more than 170 Sears and Kmart locations shuttering this year. And, things are only getting worse — many analysts say 2017 is likely the year that Sears goes bankrupt. In August, Macy's revealed plans to close down 100 stores in early 2017 as the retailer looks for a solution to slowing sales and the growth of online competitors. In November, the retailer reported that net income for the third quarter fell by 87% to $15 million, following a 46% decline over the same period last year. Same-store sales at stores open at least a year fell 3.3%. "These figures show a company grappling with what looks like terminal decline," Neil Saunders, CEO of the consulting firm Conlumino, wrote in a note to clients. Huge Boss simply isn't cool any more. In a UBS report released in December, only 20% of people surveyed said that Hugo Boss was a cool and fashionable brand, compared to nearly 40% a year ago. Being off-trend is seriously impacting sales. In November, the company adjusted its sales prediction for 2016, saying sales could decline up to 3% in the year. The handbag maker stopped selling merch at more than 250 department stores in 2016 in an effort to regain its premium, luxury status. However, the move hasn't paid off yet — in November, when reporting the company's the most recent quarter, Coach said it had its slowest growth in four quarters. A decade after it was founded by then 22-year-old Sophia Amoruso in 2006, Nasty Gal filed for bankruptcy in November. "Filing for bankruptcy is actually the most responsible decision for the business," Amoruso said at an event in Sydney, Australia when the news broke, the Independent reported. The trendy fashion retailer had been through some tumultuous times in recent years. Amoruso stepped down as CEO in 2015. In her absence, the retailer laid off employees and former workers complained of a toxic environment. It looks like Nasty Gal could get a fresh start in 2017. On Wednesday, British online fast-fashion retailer Boohoo.com announced it was bidding $20 million for Nasty Gal's brand and customer list. In December, Lands' End reported a 14.3% drop in same-store sales in the third quarter, with a 49% drop in apparel sales. That marked the ninth consecutive quarter of declining sales for the company. To make matters worse, Lands' End has also been dealing with problems in its executive suite. In September, Federica Marchionni left her position as CEO. According to the Wall Street Journal, her departure was triggered by employees' disagreements with Marchionni's more high-fashion approach to the brand as well as the limited time she spent in the office — just one week every month. As teens' interest in the brand waned, Aeropostale filed for Chapter 11 bankruptcy in May. After declaring bankruptcy, the retailer announced it would close 154 stores in the US and Canada. "Back in the day, all of the cool kids had trendy brand names plastered across the front (or back) of their clothing. The trend has changed, and style today, perhaps encouraged by social media, embraces individualism and uniqueness," wrote Nicholas Rossolillo in finance publication The Motley Fool. "Online ordering and heavy discounting have also taken a toll on the industry, especially mall-based retailers. Aeropostale simply hasn't been able to adapt." Kate Spade's sales have suffered in 2016 as tourists' visits declined and discounting grew more popular, making it harder to sell items at full-price. Now, the company is reportedly working with investment banks on a possible sale, the Wall Street Journal reported Wednesday. The news comes six weeks after New York-based hedge fund Caerus Investors sent a letter to Kate Spade pushing the retailer's board to consider a sale. Riefs declined to reveal how many workers were laid off in total. He said some stores wouldn't be affected by the cuts. "Some will have reductions or additions of full-time positions," he said. According to information from two store workers who spoke to Business Insider on the condition of anonymity, the cuts affected most of Kmart's 800 stores. Among the positions cut were assistant store managers, front-end leads (managers in charge of the customer-facing part of the store), backroom leads (managers in charge of unloading and organizing merchandise in the stock room), and pricing leads (managers in charge of pricing and store signage). On message boards, employees claim the cuts are leaving stores with a skeletal staff. The company is pitching the cuts to employees as part of a strategy called "simple stores" that involves bypassing the stock room and moving all incoming merchandise right to the shelves. At the Kmart store in Rochester, New Hampshire, the strategy has led to an accumulation of boxes on the store floor, according to photographs provided to Business Insider. Thephotographs were taken on Thursday, and the store has looked like this for nearly two weeks, according to the source, who asked to remain anonymous. Business InsiderA sign on the boxes reads, "Pardon our dust! We are in the process of transitioning the sales floor to a new look." The layoffs come as Sears looks for ways to cut costs as its debt load balloons and sales continue to decline. Same-store sales at Sears and Kmart stores fell by more than 12% during the all-important holiday season. Sears CEO Eddie Lampert recently agreed to provide up to $1 billion in financing through his hedge fund, ESL Investments, to keep the company afloat in the near term. But the credit ratings agency Fitch Ratings says Sears still may not have enough cash to make it through the upcoming fiscal year, which begins next week. The company will likely burn through $1.8 billion in fiscal 2017, according to the Fitch note published Wednesday. To stay afloat, Sears will have to raise approximately $2 billion in liquidity. Raising cash is getting increasingly harder for Sears, however, given the fact that it only has about 200 owned stores left to sell. "Fitch believes restructuring risk for Sears remains high over the next 12 to 24 months given the significant cash burn and reduced sources of liquidity," the agency said. A restructuring could mean a bankruptcy filing, as Phil Wahba at Fortune points out. Sears has more levers to pull to raise cash — such as selling off its Kenmore brand and Home Services division — but time is running out for a turnaround, according to analysts.